Last Monday's Stop The War demonstration was a landmark day. Around 5,000 people turned up on a weekday to demonstrate to bring the troops home from Iraq and to march down to parliament in what we all thought would be a protest in defiance of the police, who had banned us from marching to parliament square. However at the eleventh hour the ban was lifted and the demonstration turned into a celebration of people power, exemplified by the chant "Whose streets? Our streets!" Campaign Iran was well represented: Our banner was carried by students from SOAS at the head of the 200 strong student feeder march (the first student feeder march there has been since 2003) and our chant of "Gordon Brown here we come, Don't you dare attack Iran" put the issue squarely at the centre of the demonstration. 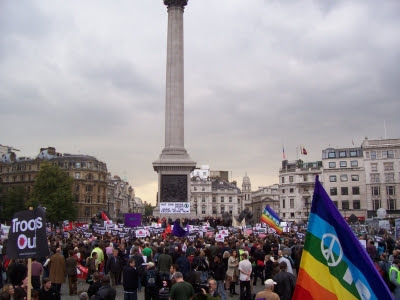 Various speakers at the rally in Trafalgar Square also warned Gordon Brown against attacking Iran. Our own Mehri Holliday drove the issue home when she spoke from the platform warning against both war and sanctions on Iran: "Sanctions are a prolonged war and cause severe suffering, and rage ultimately, giving way to political violence." she said "Sadly we don’t need to imagine this, we have witnessed it happen in Iraq . Half a million children died in Iraq as result of sanctions, and sanctions on Iran would certainly contribute to a long-term destruction of grass roots civil society. Mr. Brown, abandon the US’s discourse of ‘we want to liberate you, but we have to bomb you first’, it is much more sophisticated to be on the side of global peace and regional stability in the Middle East, you must abandon the expansionist and barbaric policies of the neoconservatives in the United States." We marched down to parliament square with those thoughts in our heads, handing out over 1500 Campaign Iran postcards to equally concerned demonstrators, but safe in the knowledge that our parliamentarians will not be able to escape the fury of the British population in the case of an attack on Iran by banning us from the streets.